One used to think of the English as mad and eccentric but the Americans have this particular corner of human endeavour fenced off now. Any man, who decides to take a year off work and go to Europe with a deaf cat and a blind, menopausal wife is asking for trouble, or at the very least a good set of memoirs. And thats precisely what we have here. A Year of Sundays is just what it says on the cover. A year out of the rat race. In this case, as a contract administrator for Ventura County in California. We all want to do it and (indeed this reviewer has) and it can only make you a better person, no matter what you do. Of course taking your cat along too is, well, absurd, but if Dr Doolittle can do it, why not Edward and Marguerite Webster? This book is in the form of a daily journal and for many, who will never have either the nerve or the wherewithal to do such a trip, this makes wonderful armchair reading from the safety of your own home. No dealing with language barriers, or strange food, or hunting Paris for the right kind of cat food. No ordeals of lumpy beds in strange hotels or renting apartments sight unseen. There is bravery in all of this. Taking wife and cat to France, Spain, Italy, Greece, Austria, Germany and Holland wouldnt be easy in the best of circumstances. Taking the extra trouble to make sure your cat is happy at all times (as it goes progressively more deaf) and that your blind wife experiences art, culture and the atmosphere of each city you visit, as much as you do, is taking husbandly duties to the level of sainthood. It is rewarding to see how caring and understanding Edward is to Marguerite, episodes in the MuseedOrsay and other places where she is able to touch and feel the art are very emotive. The book is filled with asides on how Europeans live. Take the practice of fishing with dynamite in Greece (surely illegal) Edward notes there is little fish on the menu as, of course, dynamite kills everything, not just the fish. It seems so foolish, Marguerite said. You were thinking humans are rational? He replies. There a few repetitive moments in A Year of Sundays as we lurch from one cybercafe to another to stay in touch with home. Nevertheless, in a way it is reassuring that Marguerite wants to share her experiences with friends back home and when she can, watch CNN and Larry King. A Year of Sundays is something you could keep on your bedside table and dip into from time to time, anytime you get the urge to travel but havent got the means. Edward Webster takes you there, decribes in detail and shares every meal on the way. 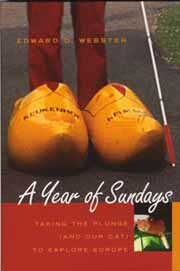 Read A Year of Sundays all the way through and you could accurately fake that you had taken a year off with aplomb and impress all your friends. Oh my God the plumbing in Italy or eat the bread in Greece immediately, it goes stale real fast.' It those details that make it all so authentic. Published by VanderWyk and Burnham the hardback is finely bound and impressively produced. This book would make an excellent gift to someone planning a European trip or a year out.